RSI Video Technologies develops innovative, wireless, self-powered security solutions for commercial, residential and government customers. Our patented security products are installed across the world in Europe, Africa, North America, Asia and Australia. The leader in wireless mesh alarm communications for the fire and security industry, AES IntelliNet is the only system that is 100% reliable (including phone and internet). Easy to install, scalable AND faster than other alarm communications systems. LAN Power Systems designs, develops and manufactures break through Technology for implementing today's Surveillance and Security Systems. Designed to utilize modern UTP Structured Cabling and legacy Ethernet devices, LAN Power's VIPER, COBRA and EAGLE Systems make installations easy, logical and cost-effective. Unique features and 3rd generation Technology make LAN Power your safest choice. Keep Your IP provides secure IP addresses built for the alarm & security industry. This way alarm dealers & installers will be able to program their own IP address to communicate their IP alarm panels to central station monitoring receivers. Keep Your IP provides independence and secure reliability in transmission of these alert signals. Established in 1998, the Connect 24 brand started as a service to activate and administer Skyroute cellular back up devices for security alarm dealers in the U.S. and Canada. In 2008, as service providers moved from an analogue service to a digital service, Connect 24 rapidly became the leading reseller of cellular primary and back up services for the security industry in North America. TelGuard combines devices for 3G/4G networks, communications and alarm processing into a turnkey system for monitoring intrusion and fire systems independent of a traditional landline. These field-proven solutions deliver 24 hour wireless protection by transmitting full data from virtually all security and fire systems to central stations using today’s cellular networks. Uplink packaged solutions have long been the security industry’s most trusted source of wireless alarm communicators, delivering the unique combination of superior value and reliable technology since 1996. Utilizing GSM or CDMA protocols, primary or back-up communications, summary or full data reporting, the Uplink family of wireless alarm communicators is compatible with any central monitoring station and most security systems on the market today. Uplink’s packaged solutions provide alarm dealers a fast, easy and highly profitable solution to meet their customer’s security and GPS tracking needs. Founded in 2008 with over 35 years of industry experience, The Technology Xchange provides a suite of consulting, product representation, design & engineering services to the Electrical Wholesale, Electrical Contracting, Life Safety, Security, and Construction industries. Kepler Networks is a complete turnkey network engineering services provider. We design, configure and install application-specific data communication networks for IP enabled Security, Life Safety, and Video Surveillance Systems. We specialize in multiple building, campus wide environments (LAN & MAN) as well as remote location (WAN) connectivity. Our expertise encompasses IP-connectivity over copper, fiber and wireless communication mediums. Alarm Financial Services provides funding programs for operating alarm dealers throughout the United States. Run by a team of seasoned alarm industry veterans, we have developed a suite of financing programs for dealers who want to grow their business organically or through acquisitions, consolidate debt, buy out a partner, etc. AFS’ funding programs range from $20,000 to $2 million dollars for small and medium-sized security, fire alarm and personal emergency response (PERS) companies. Cornerstone Billing Solutions – Cornerstone alarm billing solutions offer a unique combination of services and software. The services handle most of the billing busywork for you. Their software helps our staff efficiently manage our higher-priority work. The management team at Security Equity Partners has over 50 years of combined experience in consumer financing which includes over 10 years in alarm funding. Our foundation to success comes from experience, integrity and excellence in customer service. We understand that partnering with you comes with great responsibility. Our commitment to prove ourselves day in and day out is our belief system within our organization to earn your respect and trust. ADI a North America leading wholesale distributor of security and low voltage products. Tri-Ed is North America’s largest independent distributor of surveillance, low voltage, home automation and network infrastructure products. We are proud to provide state-of-the-art solutions from the industry’s leading manufacturers of CCTV, IP Video, access control, fire, intrusion, sound, communications, structured cable, and home automation products. The CAA is a state trade association comprised of licensed alarm company operators and suppliers of products and services. Nearly 200 alarm companies and 50 suppliers are members. The alarm companies represent 70% of the electronic security in California. UL is a global independent safety science company with more than a century of expertise innovating safety solutions from the public adoption of electricity to new breakthroughs in sustainability, renewable energy and nanotechnology. Dedicated to promoting safe living and working environments. The IQ Certification Program gives consumers a way to identify alarm companies that are committed to providing them with high-quality security and life safety systems. 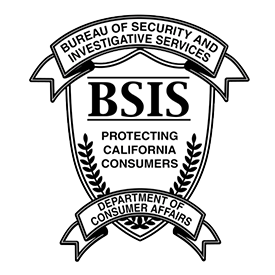 California State Department of Consumer Affairs Bureau of Security and Investigative Services. Mission: “To protect and serve consumers while ensuring a competent and fair marketplace”.